We’re switching things up a little bit today with a look at a familiar part of the landscape in Europe: street corner pay toilets. Just pop in a coin and you’ve got a quiet place to handle your private business — no latte purchase necessary. More people are calling for their installation in the United States to make cities more pedestrian friendly, with public restroom advocacy groups like Portland’s Phlush and the national American Restroom Association working to bring some of the comforts of European streets to the U.S. Inspired by a GOOD Magazine infographic illustrating the relative dearth of public facilities in U.S. cities, Malcolm Kenton at Greater, Greater Washington calls on D.C. to step up its efforts to make city traipsing more comfortable. Safe, clean, widely-available public WCs enhance the livability and walkability of a city, especially for people with medical conditions that result in needing to go more often than most. Paris is among the cities that has pioneered the use of small, on-street, pay-per-use public toilets that thoroughly clean themselves after each use. This simple, elegant design avoids the need to pay staff to clean and monitor a restroom. They can even be equipped with weight sensors or security cameras to deter illicit activity. Residents and visitors of a cosmopolitan city should not be made to feel like outcasts, be forced to buy something, or need to traipse into a hotel, museum or other large public building just to attend to an elemental human need. 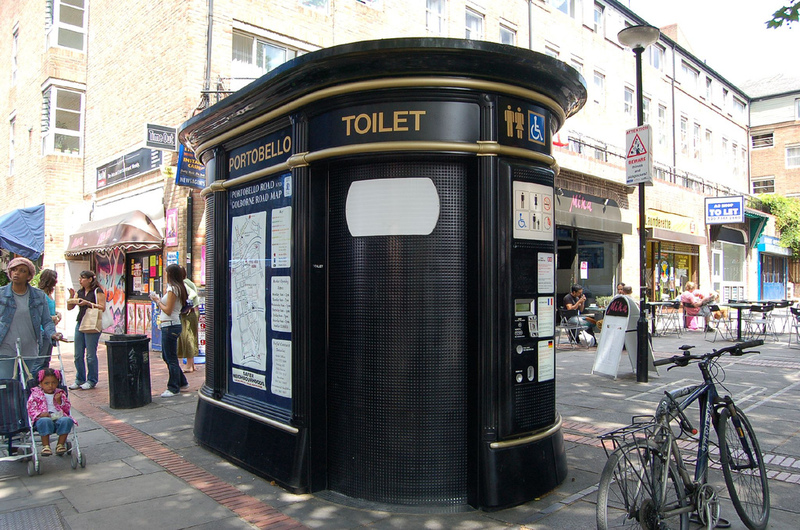 Let’s start talking toilets and encouraging local governments to follow San Francisco, Boston and Los Angeles and start installing public toilets in areas with high pedestrian traffic. Elsewhere on the Network today: Transportation for America examines San Francisco’s dynamic parking pricing strategy for reducing congestion. Making Places critiques Las Vegas’ new $8.5 billion New Urbanism development, City Center. And Discovering Urbanism examines the logic that drives many Americans to settle for suburban housing, even when they may prefer an urban setting.